Joyciline Jepkosgei, a 23-years-old woman broke her own 10 km road world record in Prague as she became the first woman to cover such distance (10km) within 30 minutes off the track. 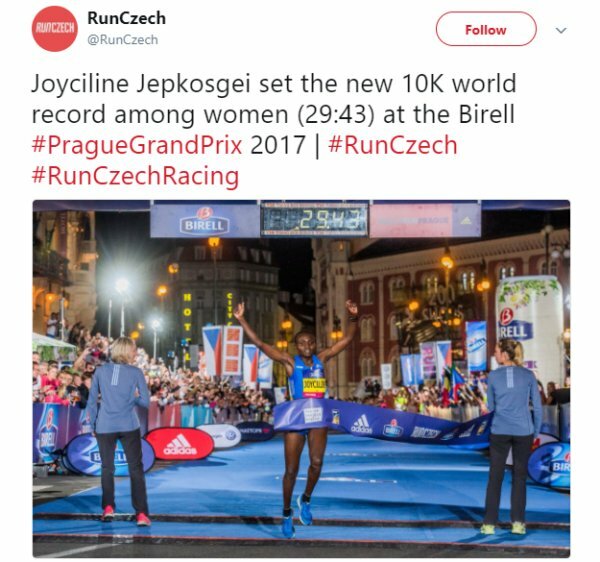 Joyciline Jepkosgei, who hailed from Kenya covered the distance within 29 minutes 43 seconds at the Birell Prague Grand Prix to eclipse her previous record of 30:04 set in the Czech capital in April. The current women’s 10,000m world record is 29:17.45, a record which Ethiopia’s Almaz Ayana set at the 2016 Rio Olympics. Joyciline Jepkosgei didn’t only make it as the first woman to run for 30min covering 10km only but has broke another four records making the total of Five world records this year by setting new marks for 10km, 15km, 20km and half-marathon at the Sportisimo Prague Half Marathon on April 1.